In my first column, back in 2004, I had the Gumption to suggest that birding is like a box of chocolates. It wasn’t the most original thing to say, perhaps, but it still applies. April proved it, for me and for lots of other eager watchers who worked around the rain and flooding. Nothing keeps birders inside during spring migration! The month began on a super high note with a trip to Morton Arboretum in Lisle. I was there to pursue an old nemesis, the pileated woodpecker. 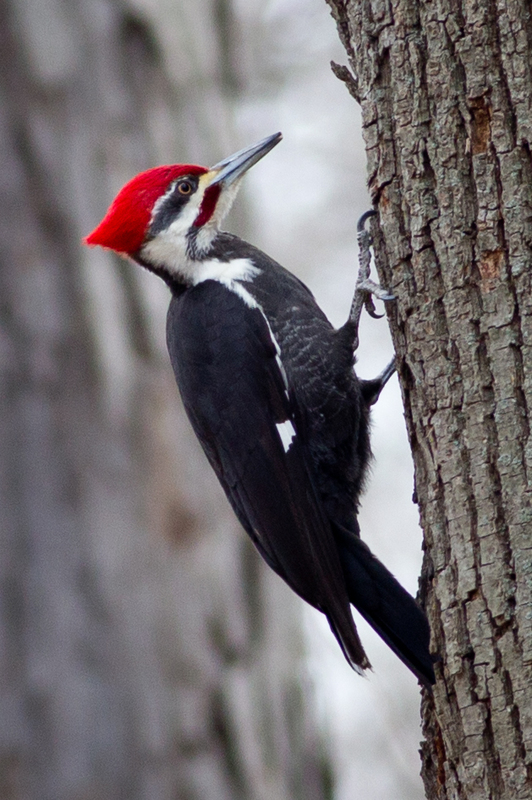 There are seven woodpecker species possible in DuPage County and pileated is by far the most elusive. I’d seen one in DuPage only once before. My previous visits to the Arboretum had come up empty, even though I knew where to look—in the woods around the Big Rock Visitor Station on the east side. But on April 7 my luck changed, and all I can figure is my wife was a charm. It was unusual for her to be with me on such a singular mission. She is not a birder but enjoys the Arb’s hiking trails. Stepping out of the car we heard a loud drumming that could only be a pileated. Across the road two men were watching something, one with a huge camera on a tripod. This is too easy! Within moments we too were viewing this large, impressive woodpecker. It was a sight worth waiting for and over the next 90 minutes we spotted and heard the bird several more times. April got even sweeter 10 days later when I encountered my first Louisiana waterthrush. A member of the warbler family, the bird had been near the top of my Most Wanted list for many years. True to form, it was teetering along the edge of a small stream—a passage that would swell to a mighty river 24 hours later. I spotted the waterthrush (and a bonus rusty blackbird!) only because I was on the Cantigny golf course early one morning checking on a great horned owl nest. The nest contains two fast-growing owlets and it’s been fun showing them to interested golfers, Cantigny employees and visiting photographers. True story: The captain of the Chicago Blackhawks, Jonathan Toews, played Cantigny Golf on April 22. When informed about the owls up ahead he became genuinely excited and couldn’t wait to see the nest and birds. Who knew? Who? Cantigny birders have been enjoying the owls too, of course. The mom and babies were among the highlights of the April bird walk, along with two flyover bald eagles that caught us all by surprise. The night before that walk I observed an osprey fishing (successfully) on the small lake by the golf clubhouse. It wasn’t on the calendar but April was evidently Birds of Prey Month at Cantigny. The owls also delivered a different kind of birding surprise last month and one I’ll always remember. As you may know, adult owls spit up “pellets” of indigestible materials like fur, bones and feathers. It’s the daily price they pay for swallowing their prey whole. Pellets are pretty easy to find if you look on the ground under an active nest. I was doing that myself last month and discovered a pellet with some silver metal on the surface. A bird band! I photographed the 3-inch pellet intact, and then took it home to pull apart and report the band number. The aluminum band, still attached the victim’s leg bone, included the website operated by the U.S. Geological Survey’s banding operation in Maryland. So I went online and filled out a form. A minute or two later an email came back, solving my little mystery: the band had been worn by a female wood duck, banded in Geneva in August 2012. The bander, in turn, was notified about when and where his band was recovered. That’s the whole point. Applying bands is how researchers track bird dispersal, migration patterns and life spans. But relatively few bands are ever recovered from dead birds. And how many are found inside an owl pellet? My experience was quite a long shot. I still haven’t made a hole in one or caught a foul ball at a Cubs game but at least I can say I found and reported a bird band. For a birder that’s pretty cool. Getting back to those April chocolates, a pine warbler signed my backyard guest list for the first time, then returned a couple days later. That’s 113 species for the yard now, a list I’m lucky to grow by one or two a year. Another bird I was thrilled to see (not in my yard) was Wilson’s phalarope. Many of them magically appeared in the area just after the big rains, tempting birders at Greene Valley Forest Preserve, Fermilab and other locations. I hadn’t witnessed a phalarope since 1999 so this one felt like a “lifer.” Plus, until visiting Fermi on April 27 I’d had never seen a female Wilson’s in breeding plumage. With this species the female is the showy one, not the male. The birding gods treated me kindly in April but I didn’t taste all the treats. Not even close. I’d have loved to see the prairie warbler discovered at Hidden Lake Forest Preserve, the dozen American avocets at Whalon Lake Marsh, or the white-faced ibis at Fermi. As you’d expect, remarkable avian treasures were reported along the Chicago lakefront, too. Among them: piping plover, Smith’s longspur, Say’s phoebe, lark sparrow and barn owl. Now it’s May, and spring migration is peaking. There is so much to see and hear, and many feathered surprises await. Take a walk. Check the backyard trees and shrubs. Put up a hummingbird feeder. Dissect an owl pellet. You never know what you’re gonna get.